Applications for military and business preceded the later development of GPS' personal use to get you to the nearest shopping centre. While telematics originally began as a simple GPS tracking tool aiding with navigation and measuring the distance travelled by a vehicle, it has since evolved into something much more powerful than that. In fact it is currently the go-to technology for businesses to optimise their fleets and maximise their overall value. There are 5 major areas that fleet management systems help businesses save money and increase efficiency. Operators perform more consistently and at a higher production level when they know they are being monitored. But with telematics they aren’t just being monitored they are also easily being compared to all other operators and vehicles in the facility. This level of accountability is an easy way to increase productivity. Telematics and fleet management systems give you complete visibility on the real time use of each truck and how many idle trucks you have at any one moment. Many systems are streaming wireless real-time data so you can see at any one moment the efficiency of your fleet. You can also check productivity levels for each truck and even each driver. Some fleet management systems such as AAL Hyster's ForkTrack system has the capability of having a swipe card, pin pad or even biometric login for each driver. The benefits of this stretch beyond checking the driver’s output and efficiency it also stretches, as we’ll see to safety procedures. Dennis Carlson a logistics manager at Steelcase is an example of someone who believed his system was inefficient but didn’t have any data to prove his assumptions and create solutions for them. With the installation of a real-time data collection system Carlson quickly realised he could reduce his fleet size by 30%. The cost savings involved with a reduction that large are enormous. With modern telematics systems managers are afforded more clarity on impacts and collisions so that the responsible party can be identified and all involved can be trained not to end up in the same accident again. Real-time monitoring also allows you a step further than this; speed infringements or impacts can trigger alarms and notifications that allow pre-emptive action to be taken before any serious accidents occur. 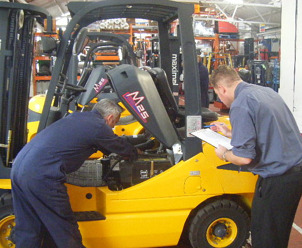 For example, Raymond lift trucks have the ability to send fault codes and lift truck serial numbers to a technician’s smartphone or computer through their iWarehouse Gateway software. 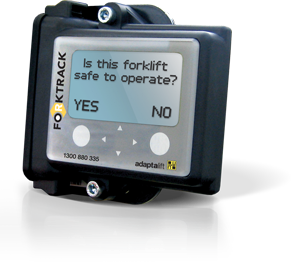 have simple safety features such as intelligent interlocking seat and seatbelt sensors to ensure that operators are as safe as possible throughout their interaction with the forklift. Most systems will also have digital weight indicators and overload lockouts to prevent the operator from overloading the truck and putting themself and others in danger. When we match these advances in telematics and fleet management systems with advances in other areas we can start to see a vision of the future. RFID technology is presenting strong advantages to fleets around the world. By using RFID a warehouse navigation system will be able to easily position all the pallet locations and create an optimal picking order for each truck. RFID also has the potential for safer operation, as transponders and sensors pick up obstructions at the ground level for man-up trucks and any truck that has its vision obscured by load. Another major advance of note is the development in automation by most major forklift providers, including, Toyota, Raymond and Nissan. With labour occupying around 75% of the total investment in the economic life of a lift-truck it is easy to get a pretty clear view of how enormous the potential savings are. This doesn't even factor the 90% reduction in damage from accidents. Remote applications are also being built to fill the gap between Conventional lift-trucks and AGV’s and allow operators to operate the vehicle while not seated in the truck. When you combine these advances you can get a clear vision of the future; a warehouse where not a single human walks an aisle or drives a lift-truck. Instead the whole operation is monitored from a computer room overlooking the warehouse and all service is conducted at a dedicated maintenance area where a few technicians keep the fleet running at full speed. Further savings will be made on power when forklifts no longer have to carry an operator or the material for their comfort. Already other parts of the warehouse have become automated and optimised to accomodate lift trucks, such as rapid roll doors for access ways. 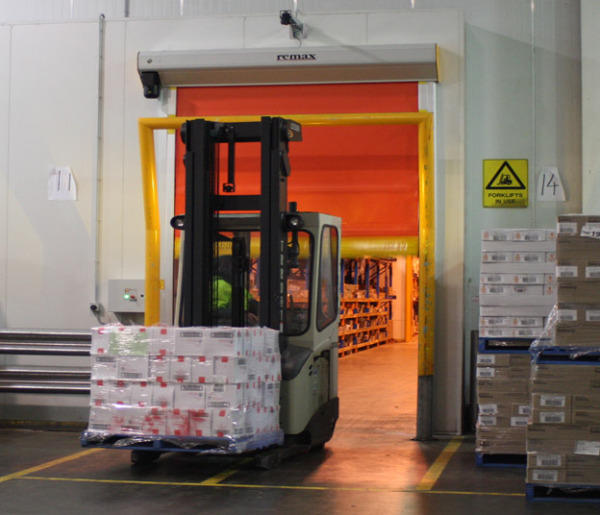 Automated doors that open on approach and quickly close after the access way is clear integrate well with forklifts to greatly increase the efficiency of your warehouse. Some suppliers even provide doors with self-repairing mechanisms that take lift truck impacts and quickily realign the door to provide minimum downtime and maximal operational efficiency. A total automation of warehouses will also hopefully eliminate the 34,900 accidents resulting in serious human injury and the 61,800 non-serious accidents in warehouses across the globe every year. While a perfect warehouse is still a long way off, the technologies being developed will come in incremental stages and just as workers and fleets are already benefitting from the advances in telematics so too will they benefit from RFID and automation in the future. One of the key moderators of the speed of these changes will be whether telematics providers can show a solid return on investment for businesses. If you would like to read more about forklifts and how to optimise them for warehouses please read last week's blog here. Otherwise if you would like a concise guide on how to minimise forklift accidents in your warehouse, download our free eBook by clicking on the button below.